Wing area: 6.0 sq. ft.
First flown in 1940, the Hawker typhoon was one of the most successful air to ground fighter planes of World War II. Designed by Sydney Camm to be the premier high altitude single seater fighter it had the speed and powerful engine to be a formidable opponent. It was especially adept at night missions and air to ground attack and defensives. 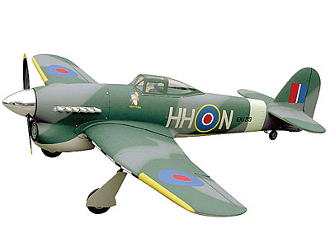 Experience the Royal Airforce's flying prowess with this scale model rc warplane!